All industrial revolutions need two things: technology and finance. The US shale revolution was made possible by the advances in horizontal drilling and hydraulic fracturing that allowed oil and gas to be released from previously unyielding rocks. But the industry’s financing was equally important in turning those innovations into a production boom that has shaken the world. The financial model that has dominated the industry has been a highly competitive group of exploration and production companies using debt raised from bond markets and bank loans secured on oil and gas reserves. Often they use derivatives to hedge some or all of their revenues, giving lenders confidence in their ability to make interest payments if oil and gas prices fall. For most of the shale boom, that financial infrastructure has been underpinned by the low interest rates and quantitative easing that followed the financial crisis. The surge in US oil production has been a result of monetary stimulus, just as much as the tech start-up boom and the rise in the S&P 500 have been. As its output has grown, the US E&P industry has been unable to finance its drilling programmes from its operating cash flows, and a constant inflow of capital has been essential for keeping it afloat. With stock markets and oil prices falling, and while the Federal Reserve is still signalling its intention to keep raising interest rates, the financial conditions that have protected the shale industry like a warm blanket may next year start to wear thin. One issue that has been highlighted by Philip Verleger, an energy economist, is the outlook for the hedging used by E&P companies to protect their revenues and reassure their lenders. Strategies vary, but the standard practice is for companies to put a floor under the effective price of some or all of their production by buying put options. Mr Verleger argues that those options have been an important factor in the collapse of oil prices to a 15-month low since October. The investment banks and others that sold those put options have to hedge their own positions, typically by selling oil in the futures market. The more likely it is that the options will be exercised, the more oil the finance companies have to sell, in a practice known as “delta hedging”. That creates a positive feedback loop: as prices fall, financial companies that have sold puts need to sell more oil, which drives the price down further. The scale of US E&P hedging programmes is large enough, Mr Verleger has calculated, to explain much of the fall in crude since October. Once oil started to fall, tipped lower by the Trump administration’s decision to ease off on blocking exports of Iranian oil, and concerns about global growth, the delta hedging effect kicked in, turning the retreat into a rout. This dynamic does not go on forever. Eventually the banks and other traders who sold puts will have fully covered their positions, and the selling pressure eases. Most of the options bought by the listed E&Ps, as disclosed in their regulatory filings, had strike prices between $50 and $60 a barrel for US benchmark West Texas Intermediate crude, implying that prices are under pressure when they are inside or close to that range. Now WTI is at $45.59 a barrel, it may become more stable. Goldman Sachs suggested last month that once the delta hedging effect had played out, oil prices could “snap back”. Mr Verleger raises the possibility that there could be a sustained impact on US E&P companies, however, if they find it has become more difficult to hedge. Reduced hedging means reduced borrowing capacity, which means reduced drilling. He suggests US output could drop 5-10 per cent next year if that kicks in. That potential squeeze on hedging would add to the other pressures already accumulating for the US E&P groups as a result of the falling oil price, weak stock markets and rising interest rates. Lower oil prices will hit the valuations of reserves used to secure bank lending, and the debt markets have become less welcoming for oil company borrowers. The plunge in E&P share prices, with the S&P oil and gas exploration and production industry index dropping 43 per cent since early October, makes it harder to raise equity finance, too. The US Energy Information Administration noted recently that US E&Ps were in roughly the same financial position heading into the latest oil price fall as they were when prices slumped in 2014. If we are in for a rerun, that would be a reasonably encouraging prospect: most E&P companies survived the last downturn, and many thrived. But as the EIA noted, “oil price volatility and uncertainty remain high”. US oil groups have overcome many challenges in the struggle to make shale viable for the long term. Next year, they can expect to face some more. Last December, Republicans relied on the support of conservative economists who predicted that the party's corporate tax cuts would boost productivity and investment in the United States substantially. The forecasts were wrong, and the silence of those who made them suggests that they knew it all along. 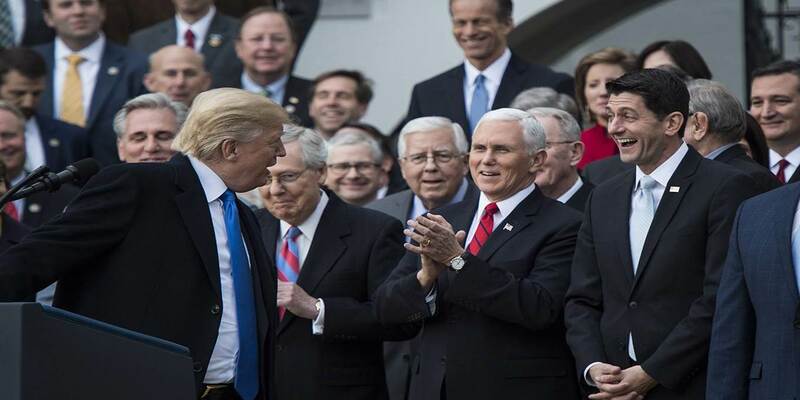 BERKELEY – It has now been one year since US President Donald Trump and his fellow Republicans rammed their massive corporate tax cut through Congress. At the time, critics of the “Tax Cuts and Jobs Act” described it as a cynical handout for wealthy shareholders. But a substantial number of economists came out in support of it. For example, one prominent group, most of whom served in previous Republican administrations, predicted in The Wall Street Journal that the tax cuts would boost long-run GDP by 3-4%, with an “associated increase” of about 0.4% “in the annual rate of GDP growth” over the next decade. And in an open letter to Congress, a coterie of over 100 economists asserted that “the macroeconomic feedback generated by the [tax cuts]” would be “more than enough to compensate for the static revenue loss,” implying that the bill would be deficit-neutral over time. Likewise, in a commentary for Project Syndicate, Robert J. Barro of Harvard University argued that the tax cuts would increase long-run real (inflation-adjusted) per capita GDP by an improbable 7%. And Michael J. Boskin of the Hoover Institution endorsed his analysis in a follow-up commentary. Finally, Kevin Hassett, Chairman of the White House Council of Economic Advisers, and Greg Mankiw of Harvard University claimed that the productivity gains stemming from the tax package would primarily boost wages, rather than profits, because foreign savers would pour investment into the US. To be sure, these were primarily long-run predictions. But proponents of the bill nonetheless claimed that we would see enough additional investment to boost growth by 0.4% per year. 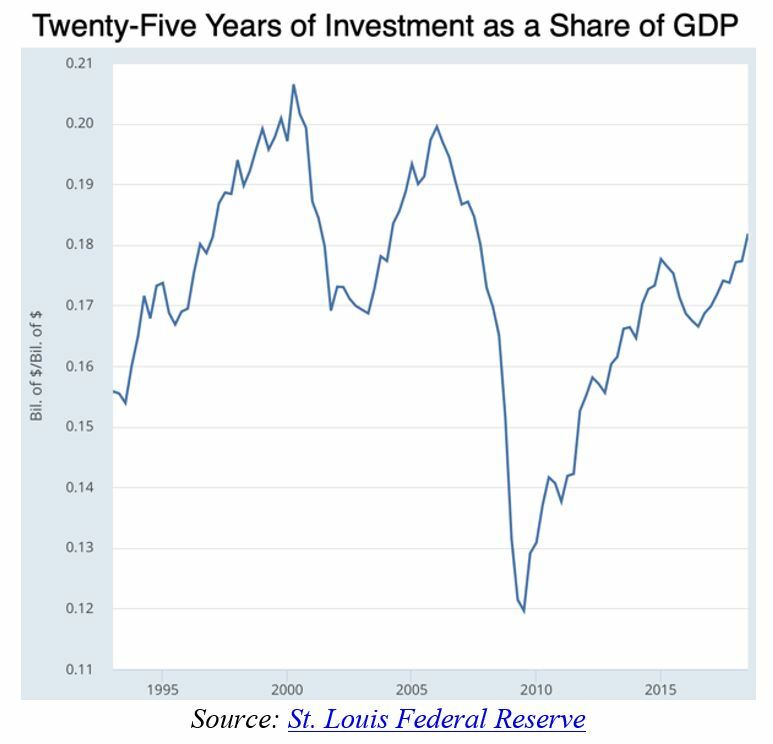 That implies an increase in annual investment of roughly $800 billion – that is, an increase from 17.5% to about 21.5% of GDP. We cannot know how much the US economy would grow in the absence of the tax cuts. But, as the chart below shows, investment has not jumped to that level, nor does it show signs of doing so anytime son. This comes as no surprise. Back when all the aforementioned economists were issuing their sanguine predictions about the tax package’s likely effects, neutral scorekeepers such as the Tax Policy Center were painting a more realistic picture. And unlike most proponents of the cuts, the Tax Policy Center’s raison d’être is not to please donors or support a particular political party, but rather to make the best forecasts that it can. We can now answer that last question. Scholarship is about the pursuit of truth. When scholars find that they have gotten something wrong, they ask themselves why, in order to improve their methodology and possibly get it less wrong in the future. The economists who predicted that tax cuts would spur a rapid increase in investment and sustained growth have now been proven wrong. If they were serious academics committed to their discipline, they would take this as a sign that they have something to learn. Sadly, they have not. They have remained silent, which suggests that they are not surprised to see investment fall far short of what they promised. But why should they be surprised? After all, it would be specious to assume, as their models do, that investment can rapidly rise (or fall) as foreign investors flood into (or flee) the US. Individuals and firms do not suddenly ratchet up their savings just because the after-tax profit rate has increased. While a higher profit rate does make saving more profitable, it also increases the income from one’s past savings, thus reducing the need to save. Generally speaking, the two balance out. All of those who published op-eds and released studies supporting the corporate tax cuts last year knew (or should have known) this to begin with. That is why they have not bothered to investigate their flawed forecasts to determine what they may have missed. It is as if they knew all along that their predictions were wrong. Fixing the problems in China’s economy entails risks to the Communist Party’s power that the president simply isn’t willing to take. China celebrated the 40th anniversary of its reform and opening era on Tuesday. Hopes were high that President Xi Jinping would use the occasion to prepare the Communist Party of China, and the public, for the painful market reforms that the U.S. administration, foreign investors and Chinese economists are demanding. After all, economic pressure has mounted from inside and out over the past few months, exposing shortcomings in China’s state-directed financial system. International opinion about the threat posed by Chinese economic policies has changed and now could cut China off from the foreign capital and technology that fueled its rise. Besides, Beijing has been taking small steps to ease international pressure and sustain its trade truce with the U.S. by, for example, lifting foreign ownership caps in some sectors. Senior officials, including Premier Li Keqiang, repeatedly pledged more such measures in the weeks leading up to the event. In his much-anticipated speech commemorating the anniversary, however, Xi didn’t sound like a chastened leader under withering pressure to return to the liberalization Deng Xiaoping set in motion in 1978. Instead, his core message was defiant: The CPC is the reason for China’s success, and its tight control – over the economy and whatever else it deems necessary – will be the country’s salvation. Reform and opening, Xi made clear, will mean only what the party needs it to mean. Chinese stock markets plummeted even as the president spoke. But beneath its bravado, the speech underscored the deeper reality that Xi and the country he leads are trapped between conflicting and unforgiving demands. When forced to choose between bad options, the CPC will pick the one that poses the least risk to its power. Xi’s speech was rife with apparent paradoxes. He decried the Mao-era “shackles of Leftism” and other “wrong policies of the Cultural Revolution,” while also calling for revitalizing Marxist-Leninist doctrine. He signaled his intention to devolve some powers to lower levels of the government after five years of doing the opposite, then declared that the party must control “all tasks.” The private sector will be the priority, he promised, but so will the bloated state-owned enterprises that are currently depriving it of liquidity. The CPC has long embraced contradiction as a rhetorical device for explaining the forces weighing on China and to justify its plans to handle them. Maoist theory held that China’s principal contradiction lies in the irreconcilable demands of the proletariat and the bourgeoisie. Under Deng, it became “the ever-growing material and cultural needs of the people and backward social production.” (In other words, China needed to get rich to emerge from the mess Mao left behind.) Xi shifted focus once again at the epochal 19th Party Congress in 2017, homing in on the “contradiction between unbalanced and inadequate development and the people’s ever-growing needs for a better life.” Baked into both changes since Mao is deep anxiety about the Communist Party’s survival. As a result, reform and opening has never been linear, and rarely has it been liberal in any traditional sense. It’s always been about letting go just enough to unleash China’s latent dynamism and rebuild what was lost in the chaos of Mao’s reign – but not so much that everyone starts wondering why the party calls all the shots in the first place. Xi, more than any of his predecessors, embodies this balance. He’s the son of a high-ranking party member whom Mao purged during the Cultural Revolution, and whom Deng later resuscitated and tasked with spearheading the pilot special economic zones in Shenzhen. Xi is no Mao-style collectivist. But neither is he blind to the risks of unfettered marketization. As he rose to power, the excesses of reform and opening had become an existential threat to the party, which had grown sclerotic, corrupt, deeply factionalized and, in Xi’s view, bereft of a guiding ideology beyond the almighty yuan. Meanwhile, China’s rising prosperity brought with it rising expectations for quality of life factors that economic growth alone can’t fix, such as clean air and water, social safety nets and more transparent governance. China’s rapid industrialization since 1978 had undermined these goals, and the party had become unresponsive and ill-equipped to deliver them. Xi’s rendition of China’s principal contradiction reflects these pressures. And so does the meaning of reform in China today – something hardly synonymous with economic liberalization. Marketization has been a major component of Xi’s reform agenda, at least as an aspiration. His inaugural economic plan at the 2013 third plenum focused heavily on giving market forces a more decisive role in the economy. The plan’s myriad goals included boosting competition among domestic firms (while still largely shielding them from foreign rivals), more efficiently allocating capital and resources and spurring innovation by lowering barriers to entry for entrepreneurs. Since then, however, progress on these initiatives has largely stalled or even reversed, beyond a few isolated sectors. Over the past half year, state sector profits have soared more than 28 percent, while the private sector has gone the opposite direction just as fast. The main obstacle for Xi’s proposed economic reforms is the enduring fragility of the CPC-led political system. Forcing Chinese companies to live and die by market forces would risk a surge in unemployment that could lead to mass protests. Forcing state-owned enterprises to compete on a level playing field – whether with private Chinese companies or with foreign ones – would disrupt the patronage networks Xi has carefully cultivated. At the same time, it would deprive the state of tools it needs to soak up excess labor, absorb unprofitable “zombie firms” and engage in economic statecraft abroad in the service of Beijing’s strategic aims in the streets. Enacting these changes would be exceedingly difficult even in prosperous times. China’s unavoidable slowdown in growth and the ticking financial time bomb its response to the 2008 financial crisis created have made rapid liberalization all the more dangerous. Xi’s CPC often tries to have it both ways, selectively introducing market concepts while also expanding the state’s role in the economy. 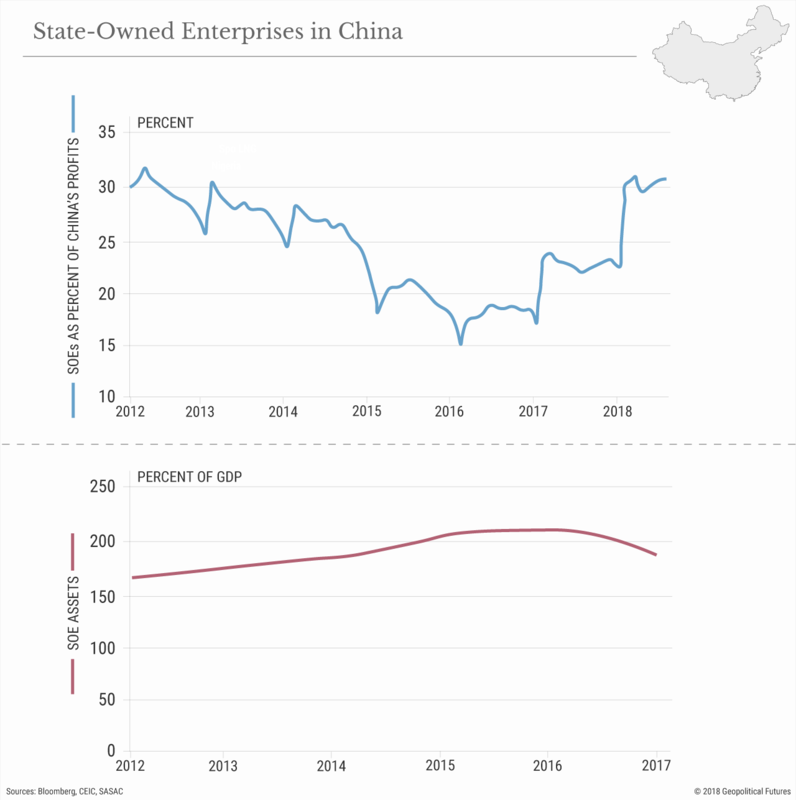 For example, Beijing is experimenting with “mixed-ownership reforms” to state-owned enterprises, in which private investors take on greater stakes and managerial authority in some failing companies in hopes of making these firms more efficient even in the absence of competition. It’s also installing CPC members on the boards of private conglomerates to mind them, tightening control over lending channels and subsidizing bigger, bolder “national champion” state-owned firms to try to acquire better technology and more market share overseas. The “over 1,600 reforms” Xi bragged about in his speech on Tuesday have been mostly administrative, sticking to the party’s familiar strategy of wrestling the state machinery into shape and micromanaging crises as they come. Overhauling institutions, purging corrupt officials and clawing back control is what the party is good at. Economic liberalization is much harder, and thus has been much more incremental, uneven and risk-averse. The hope is that by cleaning up the state – striking fear of corruption probes into the hearts of bureaucrats, power-brokers, generals and tycoons – the party can make the government more responsive to citizens’ growing demands, preserve political stability and get state-owned firms somewhere close to private-sector efficiency. This approach will still stifle innovation and growth to some degree, but party control will always be the priority. The problem is that the U.S. and like-minded countries aren’t going to stop pushing China to change its ways. And their pressure will threaten Xi’s best-laid plans for finding a path to sustainable growth. True, China has repeatedly chosen isolation over conceding to foreign demands for a rapid opening in the past, but usually only after the collapse of a dynasty. Mao, for example, managed to impose economic self-reliance to unify China because the country was then emerging from a century of war and foreign occupation, not 40 years of dazzling growth and soaring public expectations. It’s easier to take an action that will make everyone poor when everyone is poor as it is. In its current position, by contrast, the CPC can reverse reform and opening only so much before it loses the country. And so, Xi is stuck asking the Chinese people to trust in the party to figure things out on the fly.